It's innovative, its test users are all vocal fans, and the TextBlade portable keyboard has officially been on sale since 2015 —yet you still can't order it today, and get it quickly. AppleInsider visited the company to see what's happened, and whether it's worth waiting for. If this were a Kickstarter or any other crowdfunding campaign, you'd assume that it had died. Launched in 2015, the TextBlade is a portable Bluetooth keyboard with remarkable features that are genuinely unique and truly desirable. Yet four years on, it's still not on general sale. You can order a TextBlade and you will get it, but you won't get it quickly and it's more like being a limited beta tester than a customer. The makers WayTools won't discuss figures but do say that they've had millions of dollars in pre-orders from all over the world. They also say that money from these orders is not what's funding the company. The founders of WayTools previously started a firm that produces 3D scanning tools including the one used by Lucasfilm to recreate Peter Cushing's face in Rogue One. It's investments from the founders and friends which are funding the development of the TextBlade. Rather than being a crowdfunding operation, WayTools and TextBlade are following the Tesla model. You can order a keyboard and you can pay for it, but you're going to wait for the release —and you can get your money back at any time. That ability to instantly recall your money is good and the financial backing of the company appears solid as far as we can tell. The online information page about when you'll get your TextBlade is poor, though, with one line suggesting that shipping will take 4-7 days but another quoting a dispatch date in the fall. So after four years, you have to wonder whether TextBlade is ever coming out and you've got to be puzzled about what could be delaying it. Ultimately, you also have to think about whether the TextBlade is worth waiting for —and that's one thing AppleInsider can answer. We visited the offices of WayTools in California and spent several days with the owner, Mark Knighton. AppleInsider did not get to see the factories where manufacturing is being done, but we did see pallets of finished TextBlades. And, we also got to see some of the precision testing equipment that has been designed specifically for this keyboard. Then we got to interview users in the official testing group, called TREG, and we got to speak candidly with other testers who maintain a private discussion forum to which WayTools is not allowed. 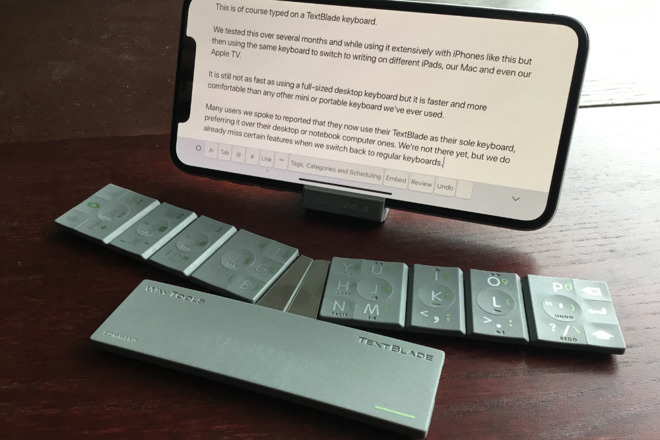 We have never been able to determine just how many people have received TextBlade keyboards, but the majority of people we spoke to have been using theirs daily for at least a year and typically much longer. What's more, we saw and got and have now used a TextBlade for some months ourselves. This is the best keyboard we have ever used. It's unquestionably the best portable keyboard we know, to the extent that none others we've tried feel like they come close. We're still sufficiently slower typing on it than on a full-size desktop keyboard that we don't use it daily with our Macs but we could, we have, and a great many TREG users do. The first thing you notice is something that actually you never quite cease to be surprised by and that's the size. 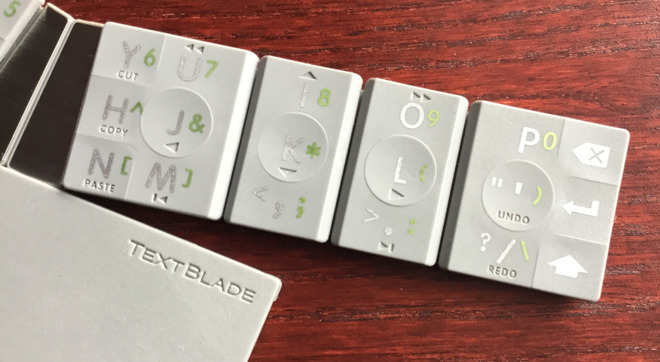 TextBlade consists of three separate parts, or blades, which snap together magnetically. The three are housed in a holder than then doubles as a stand for your phone or tablet. Folded up, the TextBlade is miniscule. There has not been a single day since we got ours that we haven't had it in our pocket or bag. There have been few days when we haven't used it. Together with an iPhone XS Max, we've got our entire office in a pocket. Yet if the smallness is remarkable, you have to assume that it's going to be cramped to type on. However, the two main blades connect at an angle that means typing may not be the same as a regular desktop keyboard, but it's far better than a typical mini one. Then, too, the travel on the keys, the distance that they move when you press them, is noticeably more than on Apple's current MacBook keyboards. That's mix of size and depth of travel is achieved because the TextBlade only has eight physical keys. Each one, though, has a multi-touch surface akin to an iPhone screen and the processor in each blade reasons which letter you meant to press. TextBlade also has combinations of keystrokes, which WayTools calls chords, that make the keyboard more than something to type on. There are cursor and selection controls which we miss terribly whenever we then use any other keyboard, for instance, and there are media controls. In the model we tested, pressing the correct chords would make the TextBlade connect over Bluetooth to any of up to six different devices. We're told that the shipping version will connect to at least double that many. In the version we have, that switching between devices feels faster than we're used to from other keyboards. WayTools claims that it is significantly faster and also that current testers have tended to use TextBlade with very many devices. 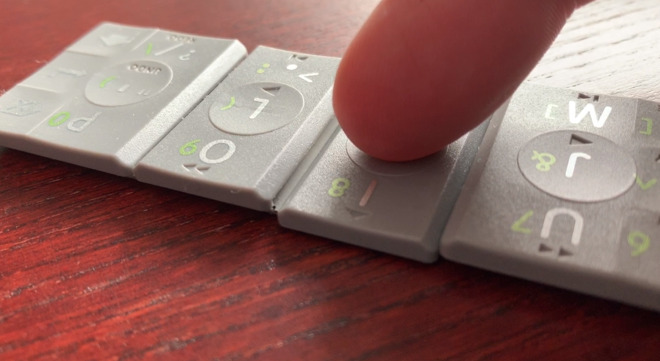 We've got ours set to type on our iPhone, iPad, Mac and even Apple TV, but reportedly there are many users who need more. One of the delays to TextBlade, then, has been in determining how it will be used in the real world and then adding features to support that. However, a perhaps greater reason for the delay is down to technical issues such as Bluetooth. We've been shown circuit diagrams and we've had Bluetooth explained to us at length, but it boils down to how this standard is far more complex and far more unreliable than it appears. 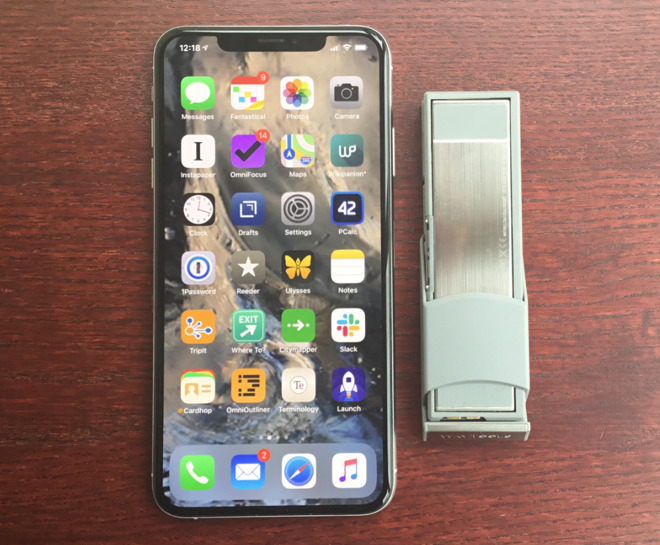 WayTools says it has worked with both Apple and Google to improve those companies' implementation of Bluetooth, specifically in iOS and Android. We checked WayTools' claims with its users who have been following each iteration of the TextBlade —and we also checked out iOS release notes from Apple —and it's true. TextBlade has caused improvements in Bluetooth. The Bluetooth details are seemingly just one of very many apparently small issues that have required extensive work. TREG users tell us that the current version of the TextBlade and its software are considerably better than when it was first released in 2015. So, work has been done and the keyboard is improving all the time. It's not flawless. We do use ours a great deal now and we've found that the slim rubber-like feet on the blades and the holder come loose. WayTools has replaced these and we've had fascinating discussions about the engineering of such tiny pieces. Yet, we still don't know a wide release date. We can say that the TextBlade is likely to ship for $120 or $130 and that people who've pre-ordered it will get theirs for the $99 they originally paid. And we can say that we want one. We've already got one, yet still this is such a tiny keyboard that we want to buy a spare or two. There are still some keyboard chords that our fingers keep getting wrong, but really our only exasperation with the TextBlade is that we never get use it uninterrupted. Inescapably, whenever we write on it anywhere, there will be someone across the room who calls out "Is that really a keyboard?" They want to try it, they want to buy it - and they always assume Apple made it.